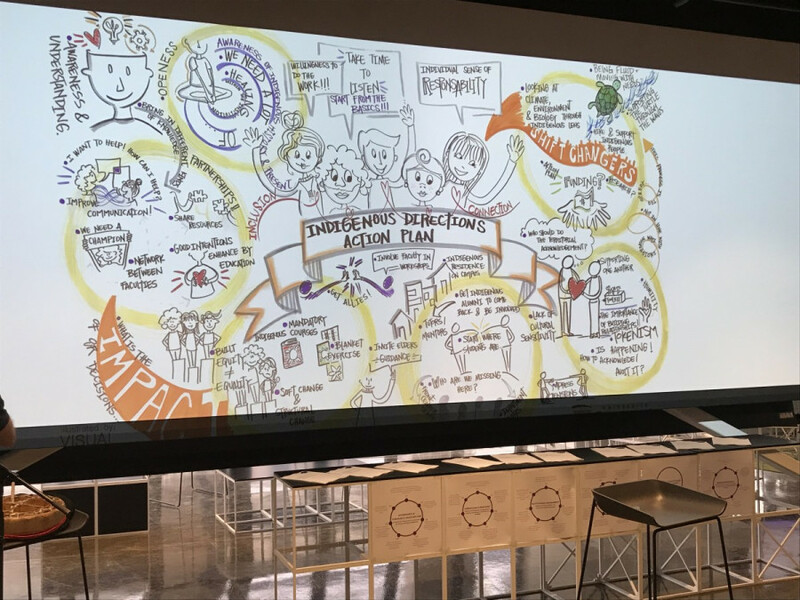 Concordia’s Indigenous Directions Leadership Group has just launched a 39 point action plan created in part as a response to the Truth and Reconciliation Commission calls to action. The action plan presented Thursday outlines what the IDLG, with the support of the university administration, will be undertaking in the coming years to better serve Indigenous students and faculty at Concordia. “Together, we can move forward today and set a path for ourselves for our future success,” she continued. The plan recommends decolonizing and anti-racist Indigenous workshops for faculty members, administration, and students. The creation of an Indigenous cultural space and naming or renaming spaces and buildings to highlight Indigenous presence and history are also among the 39 recommendations. Hiring and funding make up a large chunk of the recommendations in the action plan. This includes the hiring of a senior director of Indigenous directions, who would report to the provost. This will also entail the hiring of a permanent staff to ensure support for the work done by the IDLG. In addition, the action plan suggests hiring a high-level faculty advisor to develop and promote Indigenous research as well as the creation of a position for a full-time Indigenous community outreach coordinator. The plan outlines 39 recommendations for improving the school’s relationship with its Indigenous students and faculty, many of which focus on hiring and funding. In terms of funding, the action plan recommends the university increase the operating budget for the Aboriginal Student Research Centre. The IDLG also recognizes the university’s history in colonialism, referring to the Grey Nuns and Jesuits, and their connections to residential schools, and founding figures such as the evangelist Sir George Williams. They recommend the creation of funding for doctoral and postdoctoral research for students in First Peoples’ studies, history, communications, or a related discipline. The plan pushes for six main mandates: governance and community participation, curriculum and pedagogy, institutional environment, Indigenous students, Indigenous faculty and staff, and Indigenous research. “We set out a number of achievable concrete actions under key areas that have the potential to transform governance, students, faculty and staff, our cultural climate, community engagement, curriculum and pedagogy and research,” said Igloliorte. 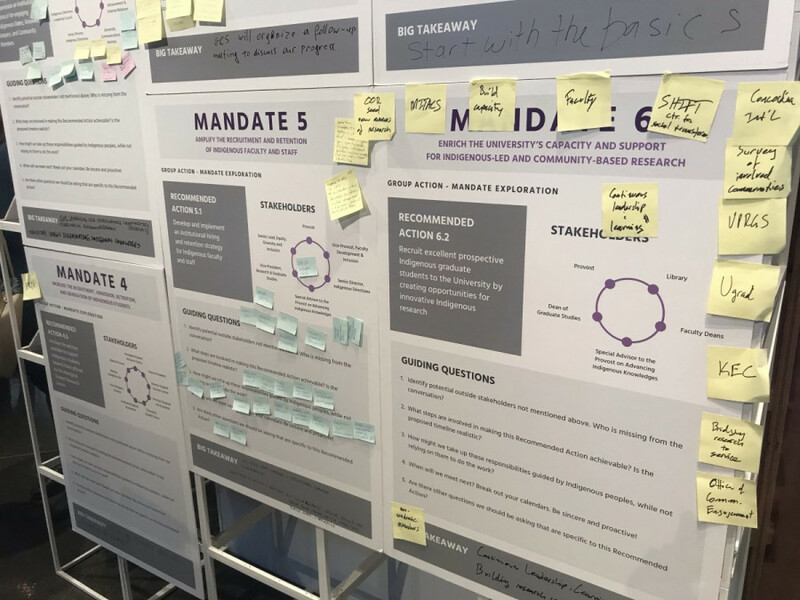 These mandates came to fruition at the end of a consultation process with Indigenous students and faculty, as well as community members outside of Concordia. “This is a day for people to be thankful to have a new opportunity to begin something fresh, which undoubtedly should have begun a long time ago,” said Graham Carr, Provost and Vice-President, Academic at Concordia. While Carr acknowledged that the action plan is in part a response to the calls to action of the TRC, he emphasized it’s also about taking action to better serve the Indigenous community. As far as the 39 recommendations outlined in the action plan go, many have already been implemented, such as a territorial acknowledgements, the creation of Indigenous Curriculum and Pedagogy Advisor Donna Goodleaf’s position, and a university-wide protocol for engaging with Indigenous elders and community members.